Come out and support the Broncho XC team by participanting in the annual 2K/4K run/walk. All ages and abilities encouraged to attend. Below are two posts I put up last year on Sunscreen. The information still applies today. Remember, an ounce of prevention is worth a pound of cure. 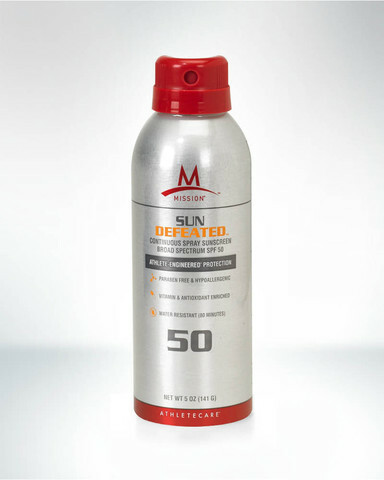 Check out this every-so-helpful starting point for your next sunscreen purchase. My current favorite sunscreen is Mission. It seems to have solid protection and is focused towards athletes. 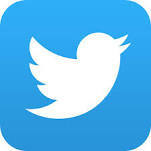 ***This referral and the repellent referral are uncompensated, professional opinions on my part. 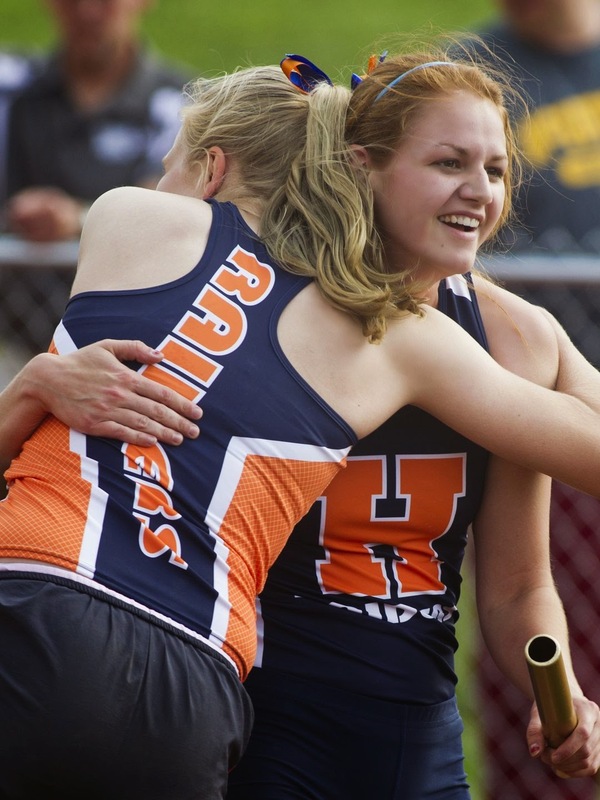 Two weeks ago, sisters Kristen and Lauren Johnson set Hoosier Conference records in the two longest high school track events. Kristen won the 1,600 in 5:04.72 and Lauren won the 3,200 in 10:56.18, both champions. Afterwards, both said they were eager to test those marks in the regional against some of the state’s top distance runners. Both of the marks by the West Lafayette sophomores from their conference meet would’ve been good enough for second place in the Guerin Catholic Sectional. 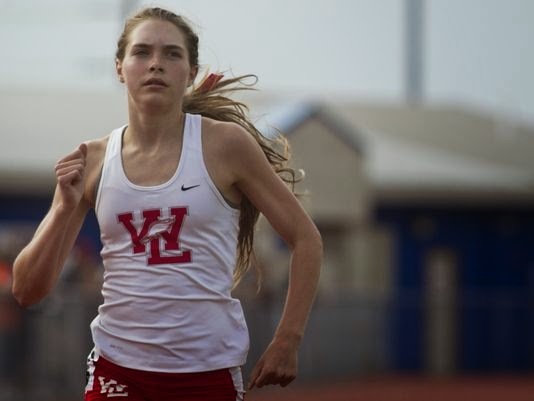 Carmel’s Kelcy Welch brings her time of 10:56.02 from last week’s sectional meet into the girls track sectional at West Lafayette on Tuesday. Hamilton Southeastern’s Rachel Nichwitz won the 1,600 in 5:01.43. The top three individuals in each event advance to the state meet. Lafayette Jeff’s speedsters led the Bronchos to a runner-up finish in the state finals last year. Though the unit is not as deep as a year ago, Jeff still possesses some big point scorers, led by defending 100 meter state champion Matt Johnson. 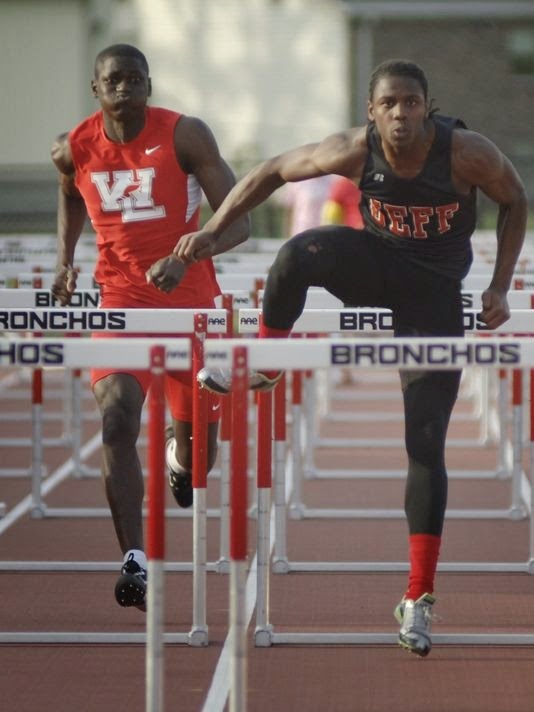 Johnson broke his own Lafayette Jeff Sectional record in the event last Thursday, winning in 10.59 seconds. Johnson is the defending regional champion and defeated some of his top competition in Thursday’s race in doing so. Carmel’s Austin Roberts and Josh Ebikwo finished 1-2 at the Carmel Sectional last Thursday. WEST LAFAYETTE, Ind. (Purdue Sports) – The Big Ten Championships are coming to Rankin Track and Field this weekend. The Boilermakers will host the 10 other league members in the three-day event to crown the conference’s best beginning on Friday. The three-day meet begins Friday at 11 a.m. ET with the decathlon 100m dash. The first final will begin at 1:30 p.m. with the men’s pole vault. Friday’s action will conclude with the women’s 10k, which is set to commence at 9:45 p.m. The action returns Saturday at 11:30 a.m. with the decathlon 110m hurdles. Saturday’s first final will be at 3:20 p.m. with the men’s long jump. 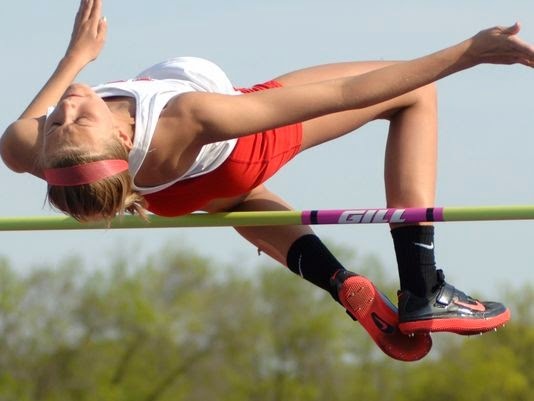 Saturday’s events will conclude with the women’s 3,000-meter steeplechase, which is scheduled to begin at 8:45. The final day of competition, Sunday, will begin at 10 a.m. with the men’s javelin. Action is set to wrap up with the men’s 4x400m relays, scheduled for 3:45 p.m.
A live results link will be posted on the track and field on PurdueSports.com and on the Game Day Central page, which will be made available Friday morning. The Game Day Central page will also feature a live, interactive blog for fans to interact with the team’s communications staff to receive updated results, pictures, trivia, pictures and more. Live updates can also be found on Purdue track’s official Twitter feed, @PurdueTrackXC, and the Big Ten Championships feed, @BigTenChamps. Full results, a recap, pictures, champion quotes, and more will be posted to PurdueSports.com following each day’s completion. Tickets for the event are $10 for adults and $5 for students, youth and seniors for single session admission. All session tickets can be purchased for $20 for adults and $10 for students, youth and seniors. Tickets will be available at Rankin Track and Field at the west entrance and are cash only. Parking is free of charge in the lots on the west side of the track. For the full story and a preview of the Purdue athletes, click HERE. 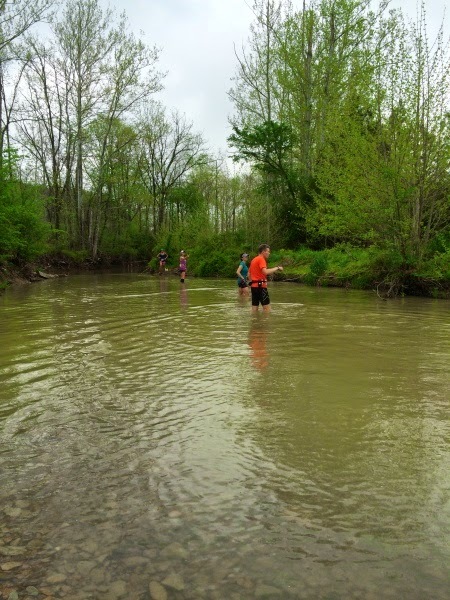 The Dances with Dirt series trail run events in Gnaw Bone, Indiana were held last weekend. 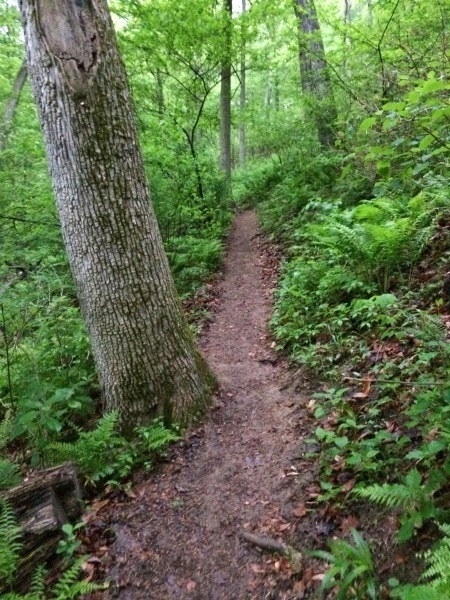 These events are run mostly in Brown County State Park and are surely a challenge for most of us "flat landers" with a lot of single track trails and just a ton of elevation gain and loss. And this year, we got about an hour of rain during the day that added to the adventure level. Thank goodness the temps were warm. It was tough, as it usually is. But, all-in-all, a rough day on the trail beats a good day most anywhere else. 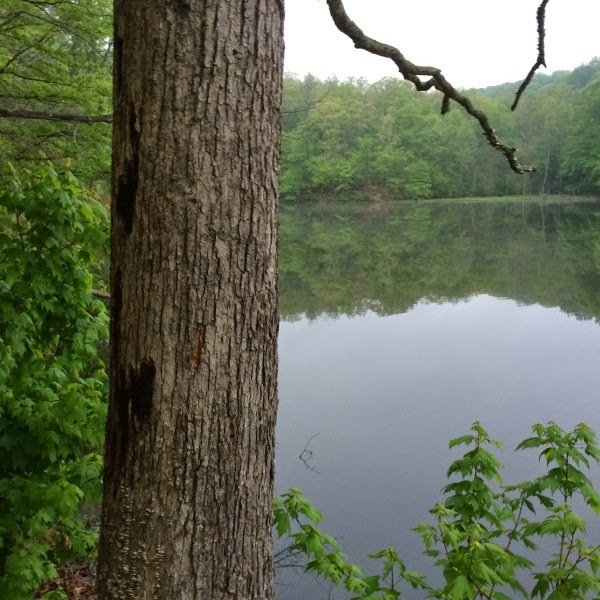 Check out some of the pictures that fellow runner Tom Chute took along the way. If I remember correctly, this is Ogle Lake. Beautiful! A lot of the trails looked great before the rain. 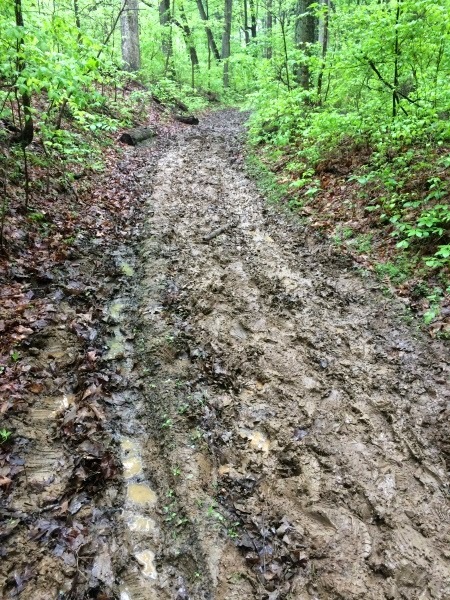 And, after the rain, a lot of the trails were a little tougher. It's a little tough losing the trail within a mile of the finish (while standing in 40 degree water)! All credit to JCOnline.com, Sam King (sking@jconline.com) for the story and Eric Schlene for the photo. Julia Bittner carried a triumphant grin across the finish line, raised her arms and crouched over before returning upright and falling into a coach's arms. Second place had never been so glorious. This race wasn't for first place or against a clock. It was about making sure West Lafayette finished ahead of its biggest threat on the area girls track scene. 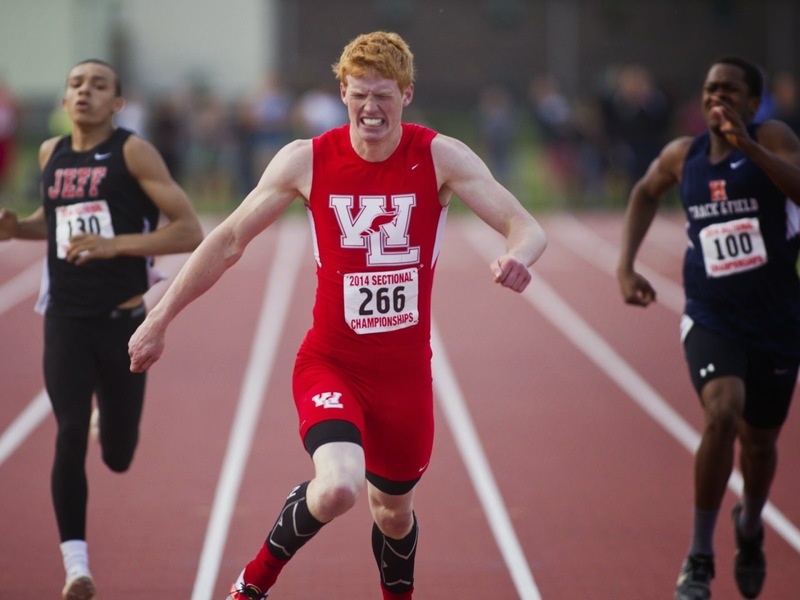 Successfully, Bittner closed the 1,600 relay in celebratory fashion as the Red Devils edged Harrison in the City/County meet's final event and the team standings, 143.5 to 142. West Lafayette trailed entering the 1,600 relay, the meet's final race. But with three-fourths of their runners battling ankle injuries, the Red Devils' second-place finish was good enough to win. All credit to JCOnline.com, Nathan Baird (nbaird@jconline.com) for the story and Eric Schlene for the photo. West Lafayette junior Jake Cohen said his ankle felt as if it were splintering. Two of his teammates on the 1,600 relay — leadoff man William Mbongo and anchor man Brandon Watt — were also nursing sore ankles. But those three combined with Jack Folkers for a gutsy clutch performance at Scheumann Stadium. 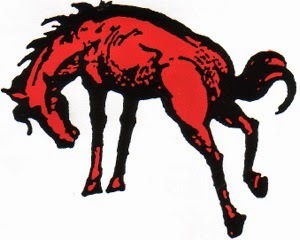 With its runner-up finish to McCutcheon in the final event, and Lafayette Jeff's fourth-place effort, West Lafayette surged past the Bronchos to repeat as boys City/County Track Meet champion by two points. The nation's largest half marathon takes to the streets of Indy tomorrow. Good luck to all our local runners. It looks like we'll be blessed with some great weather; making for some fast times.